KADINJA is a Progressive/Djent Metal band based out of France. This is their second album, following their fantastic debut “Ascendancy” in 2017. 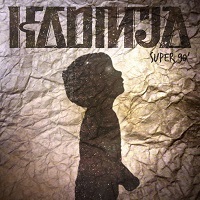 “Super 90” is a bit of an ode to the music of the 90’s, which this young band grew up on. “Empire” leads off the album. Those deep and technical djent rhythms are on full display, along with the edgy, angry vocals. The chorus blasts with a full-on sound, high with melody. The balance they strike between the two is quintessential KADINJA. “From the Inside” opens with heavy rhythms and ethereal vocals. They leave the melodies to hang out, ready for you to grasp. The mid-tempo swing is something you can get behind, and the guitar work from Danel and Godet is a blueprint for all would-be axe players. “The Modern Rage” opens with fierce guitar work and background keys high with suspense. The chorus is an open expression of vocals and guitars, while Berthet keeps a steady drum line operable. The vocals trade-off between airy elements, and moments of absolute rage. “Icon” opens with tough bass lines from Tréguier, but it isn’t long before the guitars join in. It’s one of the more introspective songs on the album and it breathes with life. “The Right Escape” opens with heavy and aggressive rhythms and light and airy vocals that turn on a dime to angry outbursts. A melody line erupts in the middle of the chaos, building layers one on top of another, ending with full djent rhythms. “Veronique” is an angry track, full with technical elements and thick with backgrounds rhythms and raging vocals. It edges on the precision of a well-oiled machine, being asked to carry off near-impossible tasks with perfection. “Episteme” is the track that I was waiting for on the album. It’s an alternate version of perhaps the best song on their debut album. Tender acoustical guitars and thoughtful vocals show their embracement of melody. When it’s slowed down like this you can really hear the beauty they possess as a quartet. “Strive” opens with chaos in the guitars, a deep and dark sound that covers the land in darkness. The Progressive elements are on full display here and if you have trouble following the precision of the guitars, you are not alone. “Muted Rain” is an interesting number, with some dissonant melodies and something that I wasn’t able to fully connect with. Although the cold and sterile guitar work is both dexterous and noteworthy. “House of Cards” opens with fierce guitar work and absolutely raging vocals. The melody shines in the chorus as they pull a 180 and deliver the chorus with smooth harmonies. “Avec tout mon Amor” closes the album with a nice little instrumental; a fittingly French title. This time, they dial back some of the dexterous rhythms and let the song flow with easy listening guitar work and melodies that are easy to assimilate. The guitar work in this song is absolutely phenomenal. I can’t say enough about the guitar work on the album. Danel and Godet lay down some of the most technical and dazzling axe-work that I have ever heard, and they are phenoms on their instruments. That being said, it does take away a bit from the melody that was heard on the previous album. Those bright and shining moments are not as prevalent nor prestigious, and I missed them a bit. But, you cannot deny the band’s commitment to their craft, and they have a very bright future.